Deary, deary me. Now it seems its getting personal between the four men at the center of the pending lawsuit over the Kyuss name. As you may remember, Josh Homme and Scott Reeder filed a lawsuit against former bandmates John Garcia and Brant Bjork over the use of the Kyuss name in relation to Garcia and Bjork’s reformation of the band under the name of Kyuss Lives! Garcia and Bjork have remained largely silent. Until now that is, with this revealing e-mail exchange courtesy of Rolling Stone. Did the federal lawsuit filed by Josh and Scott in March come as a surprise? Brant Bjork: Was I surprised? As far as Scott is concerned, yes, I was very surprised. I wasn’t surprised by Josh at all. They don’t want to mention that they trademarked the name Kyuss after I left the band, assuring that I had no rights in Kyuss’ future. They’re both accusing John and I of doing something that they actually did themselves. Their inner conflict is this: both Josh and Scott want control and money from Kyuss Lives!, but they don’t want to participate and they ultimately don’t want us to exist. The double standard is unbelievable. … We have a lot of respect for Scott as a musician and had a lot of respect for him as a person. Based on the fact that John and I jammed with Nick at Hellfest in 2010, we asked Nick to be the bass player and its quite obvious Scott is bitter about that. Scott’s stance is weak and shameful. How would I steal a name that I myself found? Trademark infringement and consumer fraud are accusations used by Josh and Scott to justify why they do not want John and I to continue as a band without them. As for consumer fraud, we had a successful last year performing sold out shows all over the world. Kyuss fans are intelligent, conscious people. If they thought this was consumer fraud, they wouldn’t have supported it. Their accusation of consumer fraud a year after our successful tours is very insulting to us and to the fans. I don’t think there are any real winners in this – at least Black Sabbath had already done their best to sully their reputation before the Bill Ward fiasco, but at least they’ve come out of it relatively clean time and time again. There are plenty of losers here – myself and fans of Kyuss the world over will be disappointed at how readily this lawsuit appears to be played out in public, and its more certain than not that more dirty laundry is going to come out of the wash yet. You can read the full entrée here. 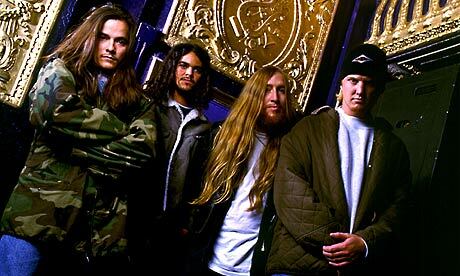 Posted in Kyuss, Kyuss Lives, News, PC, US. Josh Homme and Scott Reeder sue Kyuss Lives! Sad news indeed. I sincerely wish the above headline was a work of fiction, but unfortunately the news is very true. Yep, Queens of the Stone Age and ex-Kyuss guitarist Josh Homme, along with former bassist Scott Reeder, have filed a lawsuit against Kyuss Lives!, the reincarnated version of Kyuss formed by former bandmates John Garcia, Nick Oliveri, Brant Bjork, with Bruno Fevery enlisted in Homme’s former role. Following a successful reunion at the end of 2010 which resulted in an excellent tour in 2011, Kyuss Lives! were all set to record a new album. They ploughed on in spite on Nick Oliveri’s arrest following a stand-off with police outside his house, enlisting the services of Reeder in his place. Now though, it seems the band’s name is about to get dragged through the courts, the mud, and all of befouling stigmas. “With open arms, we made every attempt to help them continue Kyuss Lives! respectfully, only to discover while they looked us in the eye, Kyuss Lives’ management and band had filed federal documents in 2011 in an attempt to steal the name Kyuss … It’s a sad day for us and for John – but most of all for the fans. Homme and Reeder have filed a lawsuit, citing trademark infringement and consumer fraud. Crikey. Any action which results in a band’s reputation being forever sullied is regrettable whichever way you look at it. I’m not Homme’s biggest fan – I respect his talents, his work, and without doubt he’s one of the greatest rock stars around. As a person I find him somewhat irritable at best. But I don’t want to get into all that. The charges are a big deal and supposing they are true, Homme and Reeder may have a point. Still, purely as a fan, this news dejects me. I had a crazy, awesome night watching Kyuss Lives! with my brother in Manchester in April last year. It really felt like the good times were back for this band, even sans-Homme. Alas, it can’t be long before the mud-slinging begins. And there’s nothing I can add to the last part of that statement that can sum it up for the fans any better than Homme and Reeder can. We’ll be keeping a close eye on this one. Let’s hope they can resolve this issue in a more savoury fashion than its heading right now. Posted in Kyuss, Kyuss Lives, News, PC, Rock, Stoner Rock, US.